E-TORL Lamp Technology: Most Epson projectors utilize this lamp technology which is exclusive to Epson and offers two key benefits. E-TORL lamps by design minimize both light defraction and light leakage which provides up to 50% longer lamp life than its competitors. To make this even more compelling, E-TORL replacement lamps typically cost up to $150 less than competing replacement lamps lowering the total cost of ownership during the life of the projector. Monitor & Control: Organizations are always looking for ways to save money and to conserve on energy. Additionally, facilities managers are looking for ways to streamline maintenance of assets. Easy MP Monitor software included with Epson projectors allows you to connect to your projectors over your existing network to monitor and control them remotely removing the need to walk to each room to check their status or turn them off at the end of the day. You can also remotely view the status of each projector like power status, temperature and lamp hours. Message Broadcasting: While this can be useful for many applications, this is probably most important in educational institutions where emergency broadcasting has become more necessary over time. This feature allows you to send real-time messages and announcements to Epson projectors that are connected to the network. Quick Connect Wireless: This feature allows you to use the built-in wireless capability of your computer to present wirelessly to a compatible Epson projector. 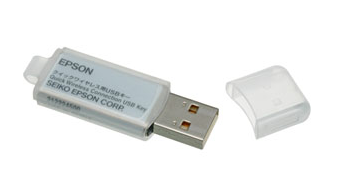 The Epson Quick Connect Wireless USB key connects to your computer’s USB cable and can allow for multiple users in a room to be able to switch between presenters without having to switch cables. USB Plug ‘n Play & PC-Free Presentations: Depending upon the model of Epson projector, many have the option of connecting your computer via a standard USB cable to have your presentation instantly projected without having to fuss with presentation settings on your PC. Additionally, several models allow you to present directly from a USB stick simply by plugging it into the projector removing the need for the PC altogether.